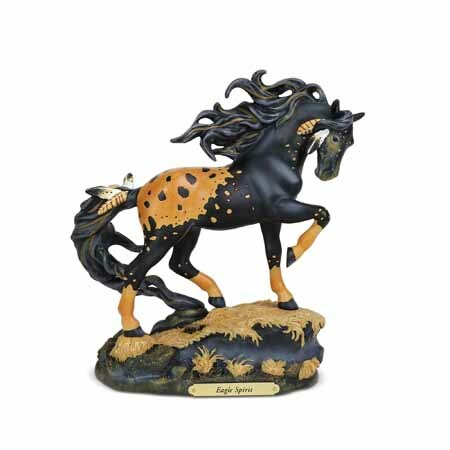 Eagle Spirit | Painted Ponies Everyday Figurines | One Price Low Flat Shipping! From the Trail of Painted Ponies 2018 Summer Set, Eagle Spirit, triumphant and proud black and tan colored Native American horse figurine. Designed by acclaimed equine artist, Lorna Matsuda. Made of stone resin. Measures 8.5" tall. According to legend, Eagle Spirit was a horse born deep in a hidden forest under the watchful eye of an all-powerful eagle endowed with magical powers. To bond them in spirit, the eagle added golden colors from his feathers to the colts black coat. And as time passed and Eagle Spirit grew into a magnificent stallion, with each act of bravery, courage, devotion and wisdom, an eagle feather would float down from the sky above, and attach itself to Eagle Spirits flowing mane and tail.